Refinance your current loan from another lender and get a new low rate, cash back and your first payment isn't due until Spring! This is a Limited Time Offer. 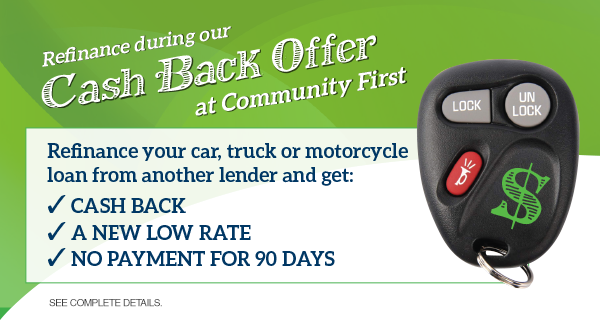 Refinance your car, truck, motorcycle or other vehicle today! Auto loan rates are now as low as 2.49% APR* for a 36-month term and as low as 2.95% APR* for a 60-month term. Visit our office, call 440-997-5919, or apply online now. *Your rate can be higher or lower depending on credit performance. Financing up to 100% of current loan balance of the auto is available. Rates are subject to change without notice. Auto loans currently financed through the credit union cannot be refinanced with this offer. Credit may not be extended if, after you respond, we find that you do not meet the following criteria, including but not limited to, length of employment, your income, debt status and ability to pay in relation to the loan amount requested. Additional criteria may apply. We can cancel this offer if you do not meet the criteria established in this offer. $150.00 Cash Back available upon closing of loans $10,000.00 and greater. Interest accrues from date loan is funded. We reserve the right to extend or end this promotion at any time. To obtain additional information, please contact a CFCU Loan Advisor for more details.